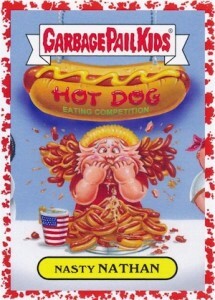 2016 Topps Garbage Pail Kids American as Apple Pie in Your Face is a mouthful, but for collectors the GPK release combines a lot of familiar elements with a patriotic theme. The America-centric product also has exclusive items in both Hobby and Collector's Edition boxes. Featuring a diverse checklist with nine new base themes, the 220-card American as Apple Pie in Your Face base set is packed with American parody goodness. American as Apple Pie is the primary parody option at 84 cards. American Swept Under the Rug (18 cards) covers topics that might not be the proudest moments for the USA. America's Pastimes (18 cards) takes a humorous look at top sports like baseball, football and basketball. American Icons (18 cards) focuses on notable figures from history. American culture is critiqued in Americana Devolved (18 cards) and top inventions like toilet paper and the trash can are included in American Inventors (18 cards). Additional base subsets include the top options for the White House in 2016 Presidential Candidates (10 cards). Even the Olympic team is not spared in 2016 U.S. Summer Olym-Picks (18 cards). Lastly, U.S. Historical Moments (18 cards) spoofs noteworthy moments in history. In addition to the base set, parallels can also be found in 2016 Topps Garbage Pail Kids American as Apple Pie. Bruised drops one per pack in Collector's Edition. Spit Splatter is exclusive to Hobby and limited to 99 copies. Bloody Nose (75 copies per subject) is also only found in Collector's Edition packs. Gold Dust (50 per subject) is the only non-exclusive parallel. There are also one-of-one Printing Plates. Averaging one each per box, a pair of inserts are exclusive to Hobby boxes. Comic Covers include eight different IDW comic book covers and Horror Stickers feature those characters that parody the horror genre. 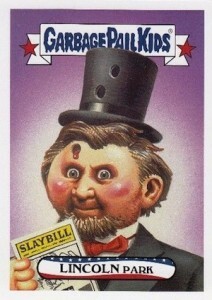 Adding more to Hobby format, several hit options await collectors in 2016 Topps Garbage Pail Kids American as Apple Pie. Die-Cut Sketch Cards are each one-of-a-kind pulls with a unique shape. Among several premium inserts in Collector's Edition boxes, Dual Artists Panoramic Sketch Cards combine sketches from two different artists on one fold-out card. Patriotic Patch Cards (#/50) include ten political slogans on a manufactured relic. Artist Relics (#/99) offer a greater connection to the artists with pieces of painting work shirts from the creators. Limited Autographs can also be found in the product. 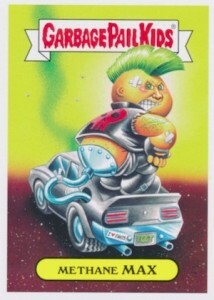 Garbage Pail Kids Panoramic Sketch!Apple Pie!OS2-Cracked Jack!Matthew Kirscht!! *AUTHENTIC* 1986 GARBAGE PAIL KIDS CARDS #121 A B APPLE CORY DWIGHT BITE. MINT! 42 a/b cards, 84 cards total. Full base set has 220 cards. Shop for complete base sets on eBay. 8 cards (Hobby exclusive). 1 per box. These are awful. 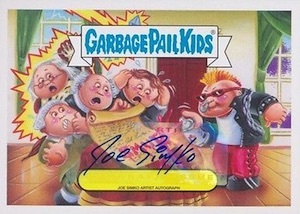 They hardly look like GPK’s anymore. I’ve been collecting these since the 80’s and the 30th aniv. set was the worst set since they’ve come back out. This theme stuff is for the birds. Give me a few GREAT cards instead of 220 CRAPPY ones. 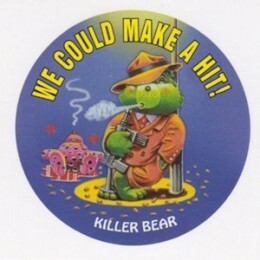 I hope there are enough complainers to put Topps GPKs back on track. I agree; I was disappointed in the 30th Anniversary releases as well–they are getting too many releases going and too many cards per. Go back to 80 cards per set and give the artists a bit more time to make quality cards instead of this cookie cutter stuff. I love the new series I’m glad they have them back on shelves. I hope they come out with some star wars packs.